Good guys always finish last. It’s a sad thing. 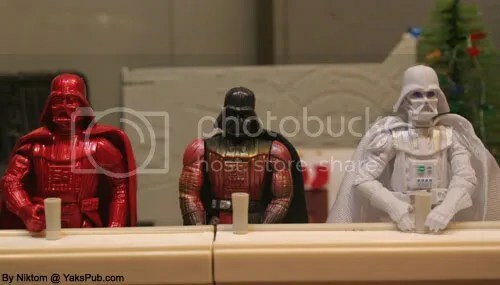 As suprised as I am at three different colored Vaders (non black,) there’s still the silver one! I’m waiting for “Water Reflection” Aqua Blue, or “Mon Calamari Armor” Dark Blue, or “Endor Camo” Green and Brown! Thing is… there is also the hologram Vader (translucent blue), another silver one in a multipack (I think it was a different mold from the first silver one) and the first comic pack Vader (a lot of blue paint apps). That may cover them all. But yea, even though that’s several… I too fear what my get produced. I have to say the white one takes the cake though. I had not ever read that comic series so had no idea why or how a white Vader came about. Now that I know the story behind it… the figure is even more lame. how many good ol’ days are you going to have? Sad sad sad what Hasbro has done. 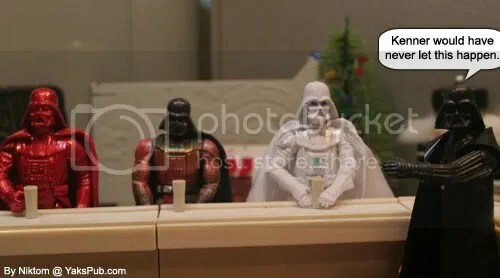 Just in the 30th Anniversary collection alone there were three or four different versions of Vader. The Original Trilogy collection that came out in 2004 had three Vaders…. they released one for each movie!